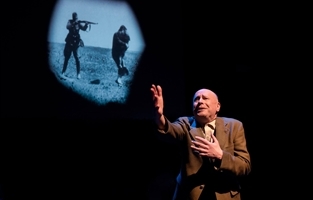 THE OBLIGATION is a full-length, one-person stage work that explores little-known aspects of The Holocaust and the post-war survivor experience. 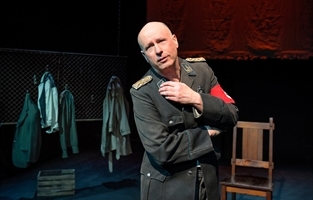 It was several years ago that Roger Grunwald conceived of and began to develop an original Holocaust-themed solo stage work. Shortly thereafter, in collaboration with co-author and director, Annie McGreevey, they developed The Mitzvah. 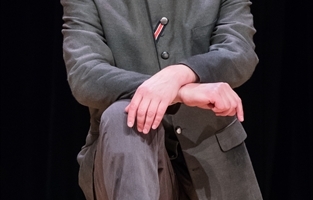 Since 2014 Grunwald has been touring The Mitzvah to great acclaim along with an original lecture. 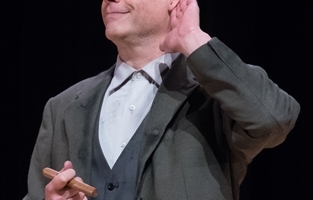 Over the course of 2016, Mr. Grunwald re-conceived and reworked the combination short play and lecture (known as The Mitzvah Project) transforming it into a new, full-length one-person stage drama called The Obligation. The new play, which had its theatrical (and world) premiere October 12, 2017 at the Potrero Stage in San Francisco under the direction of Nancy Carlin, incorporates, expands upon and deepens the narratives, characters and themes of The Mitzvah Project. 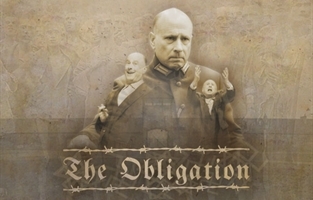 To view The Obligation's video trailer, click here. The Obligation will have a 2018 remount production in San Francisco in October. For more details, click here. 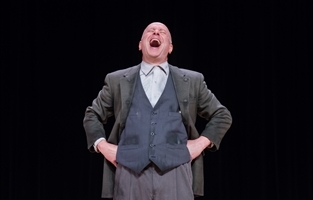 At its core, The Obligation is the life story of Schmuel Berkowicz, a Polish Jew from Bialystok (and a central character in The Mitzvah*, the short one-person play at the heart of the original work). 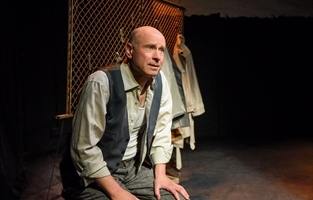 The Obligation follows Schmuel’s life from his tween and teen years into young adulthood as the world around him descends into The Second World War and The Holocaust.It’s a story of boyhood crushes, innocence lost, survival and liberation. 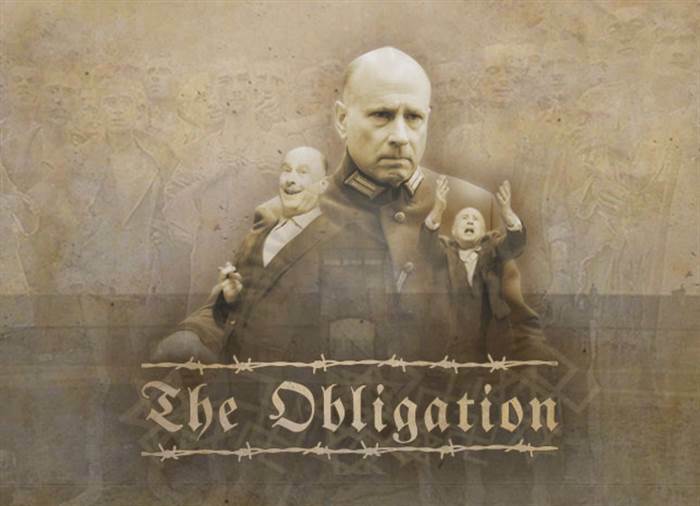 The Obligation also features the strange and shocking story of Christoph Rosenberg — another character from The Mitzvah. 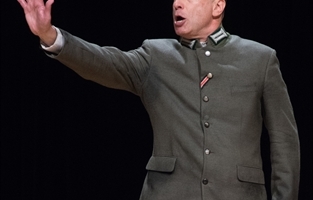 Christoph is a German half-Jew who was an officer in Hitler’s army. 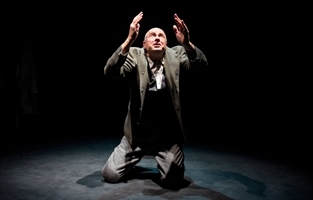 We get to know Christoph when he crosses paths with Schmuel during the darkest days of The Holocaust. In addition to Christoph and Schmuel, The Obligation also includes a character called The Chorus who appears in The Mitzvah as well. He’s an American-Jewish comedian/social critic, who leavens the play by injecting edgy commentary and satirical observations. The Chorus probes the boundary between the absurd and the horrific. “The Obligation has great personal meaning to me,” says Grunwald. 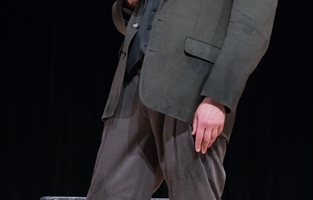 “It represents the fulfillment of a promise to honor the memory of my mother — and that of other survivors and victims of The Holocaust -- by using my performing and writing skills to connect the theater and its capacity to touch people with the the historical necessity of keeping the lessons of The Holocaust alive." “The choice-less choice” facing The Ghetto Jew: This conflict played out within the confines of the Nazi-controlled ghettos — between the desperate ghetto Jews, the Jewish Council (The Judenrat) and the Jewish underground. Members of the underground, once they became aware of the Nazi plans for mass extermination, tried to prevail upon the councils and the ghetto population that fighting the Nazis — for their collective dignity, even though death was a virtually certainty — was the only true course. What they were up against were the Nazi-appointed Councils, convinced (and duped) by the Nazis that “work,” i.e. slave labor, would “save” the ghetto Jews. The starved, disease-ridden and brutalized Jews desperately hoped — and wanted to believe — that they could save themselves through work. It was but another cruel and deadly Nazi deception. 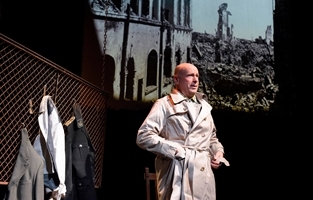 Reparations (Wiedergutmachung): Another conflict that is played out in The Obligation is the post-war fight between survivors who refused to take reparations from Germany — calling it “blood money” — and others who applied for and received compensation because they were “owed by the Germans” — owed for the monstrous crimes that had been committed against them, their families and the Jewish people. Post-War Survivor Suicide: The Obligation also engages the tragedy of post-war survivor suicide. Many survivors took their own lives — in some cases, many years after liberation — unable to live with their guilt at having survived while family, loved ones and so many millions of others perished. Some took their lives, unable to endure their own unremitting psychic pain — memories of what they themselves had lived through and witnessed. The preceding are some of the major themes in The Obligation. For inquiries and more information, click here.